I spent this past week studying the story of Gideon – as I prepare to teach this with our women’s group over the next 6 weeks. When I talked with some of our staff they told us that they were not very familiar with his story. I love it when I can teach something that they aren’t familiar with – and quite frankly even I didn’t know much of his story either. This past Friday, 20 ladies from our Bible study walked to Karenage to choose 20 women who didn’t have a relationship with Jesus – to participate in our 2nd Discipleship Program. We honestly were not sure how many of the ladies would want to be involved. We have tried ministering to that fishing village time and time again. Many of our efforts have come up void. We were not sure what kind of response we would get. It’s a 30-minute walk from the Mole to Karenage. We decided over the next 2 months – we will hold 4 weekly sessions in Karenage and 4 weekly sessions in the Mole. This meant that not only are we asking these ladies to allow us the chance to minister to them – – but they also have to work for it – since they too will have to take that 30-minute walk every other week. Momma Gigi, Mme Nene, Elirose, and I prayed several times together this past week about this Discipleship Program. We were nervous that the homes we visited would want nothing to do with us. But as our ladies reached the village – the entire town was excited to see them. It’s not just every day that 20 women show up together singing and praising Jesus – especially in a small village like that. To our surprise every single lady accepted our invitation to be apart of this program and on Wednesday we will hold our very first meeting with them. At that time I hope to take their pictures, learn about their families, and begin praying for them by name. I’m only one-week into our study on Gideon and yet I can already see the life lessons that will be engraved in my heart. When we started this women’s group 4 years ago it was really rough. I honestly wanted to give up on the church and everyone in it. I am a nurse and purposefully did NOT go to Bible College like everyone else in my family. All of a sudden we were responsible for managing the church and all the activities that our congregation would participate in. When we started our ladies group – many of them came at first just to see if we gave things away. We had several ladies that tried to divide the group and chaos was the theme for our first year here. Many of these same ladies were also involved in putting curses on our steps – curses that we could not see the truth of what was going on in this town. Follow me here for a moment…. If God would have told me 4 years ago that this week 20 of those same ladies would be some of the strongest advocates and representatives of Christ – I don’t think I would have believed it. That first year and even the 2nd year – I thought it would be impossible for us to have a group of ladies united for the sole purpose of establishing a relationship with Christ. Just like Gideon – I really had no idea what our life was going to be like here in the Mole. My mom was pregnant with me my first trip to Haiti and when we moved here it was like those 30 years in St. Louis didn’t even exist. This was a new village with new people and we had to start from scratch. I remember the first week we were in the Mole. I kept thinking – What in the world did we just do? We left our comfortable life -we left the family and friends we knew – we left an established ministry – to come as far northwest as we could to reach a people who didn’t really want to be reached at the time. Isreal was making decision based on their limited supplies instead of the boundless resources of their God. No weapon could stand against the power of Yahweh. The Isrealites thought having access to some of the promised land was better than having to FIGHT for it all. So they were comfortable. They chose to enjoy the quiet rather than upsetting others by obeying God completely. If they would have only done what God asked they could have enjoyed all that Jesus had for them – instead of facing the struggles and oppression from their neighbors. God has positioned each of us to be His representative, beckoning our ailing culture to Him – one person at a time. His hand is on us to wage war against the enemy without our spheres of influence. What is it God wants you to do? Do you find it impossible to believe? The truth is, whatever God wants from you, it’s probably even more impossible than you could imagine. God is accomplishing His purposes on earth through men and women today. If you told me four years ago we would be a leading force against sexual abuse & slavery in this town – I would have never believed it. If you told us that we would be working hand in hand with the Haitian social services I’d think you were smoking something! The growth that has happened here these past four years seemed impossible each and every year……but we will continue putting our fleece out – waiting for God to show us the next step. We are ready to get out of our comfort zone so that we can enjoy all that Christ has in store for us! Are you ready to stand with us and wage war on the enemy? It WILL require obedience through chaos! But the great thing is – you can do it right where your feet are planted! 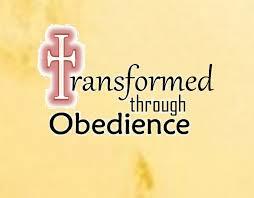 We can be transformed together – all across the world – through radical obedience!